The Sunday NFL Countdown lineup will consist of Chris Berman, Mike Ditka, Carter, Tom Jackson, Keyshawn Johnson, and Chris Mortensen. Monday nights from Bristol also will feature Berman, Ditka, Carter, Jackson, Johnson, and Mortensen. Stationed at the game sites will be Stuart Scott, Smith, and Steve Young. Very sad news as about 80% of Emmitt's stellar comments came on the Sunday edition of Countdown. There is good news though....Emmitt still has a spot on Monday Night Countdown along with newcomer Trent Dilfer! You can also tell that this is the first of many problems that ESPN will run into in regards to scheduling. They're either going to have to phase Emmitt out entirely or continually move people around to give everyone an opportunity on-air. That's what happens when you employ 8,000 different analysts. Former All Pro wide receiver Cris Carter has been named an analyst for Sunday NFL Countdown (11 a.m. 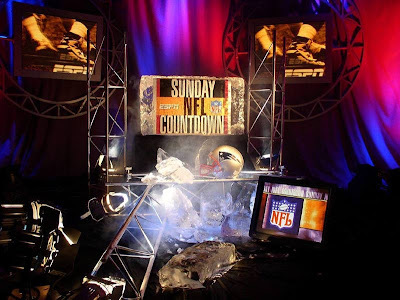 ET) and Monday Night Countdown (7 p.m.), ESPN’s popular NFL pre-game studio shows. In addition, Emmitt Smith will move this fall from Sunday NFL Countdown to the new expanded Sunday morning editions of SportsCenter (8 a.m. and 10 a.m.) where he will offer insight and analysis during NFL segments. Smith will also continue to travel to the Monday Night Football game site each week for Monday Night Countdown. He got all blowed up for no reason. The guys at walterfootball.com will be very disapointiated. Don't quit. Don't even quit.